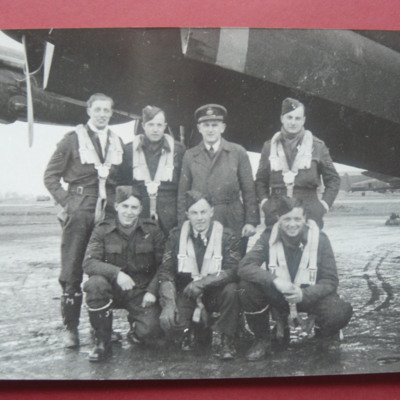 A group of seven airmen, including Malcolm Staves standing in front of a Lancaster. They are wearing full flying gear. 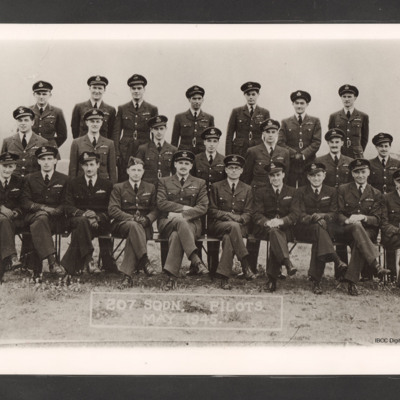 24 airmen arranged in three rows and captioned '207 Sqdn. 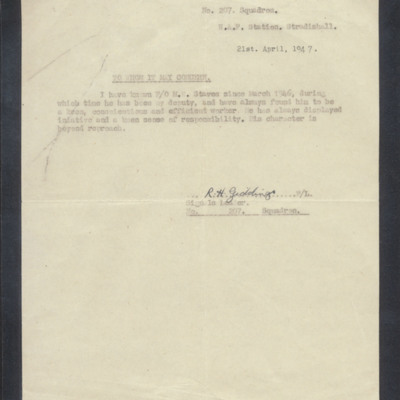 Pilots May 1945.' 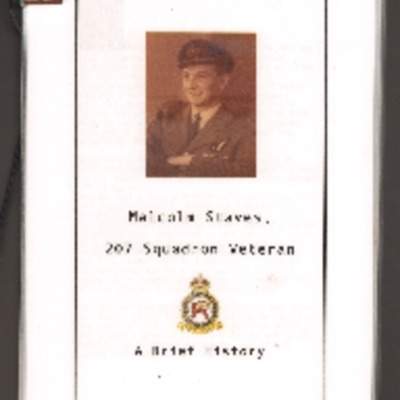 On the reverse '406 Malcolm Staves'. An air-to-air view of three Lancasters 'EM-F', 'EM-A' and 'EM-C' flying in a V- formation over an airfield and countryside. On the reverse 'Dad's Lancaster (centre A)'. 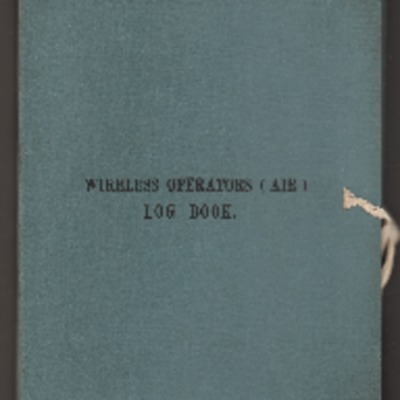 Wireless Operator's (Air) Log Book for operation to Cham 17 April 1945 including call signs, actions, bearings and fixes taken. Seven airmen below the open bomb doors of a Lancaster. Four are standing and three are kneeling. Eric Varney is kneeling bottom right. All except one person are wearing parachte harnesses. There is another Lancaster in the background. 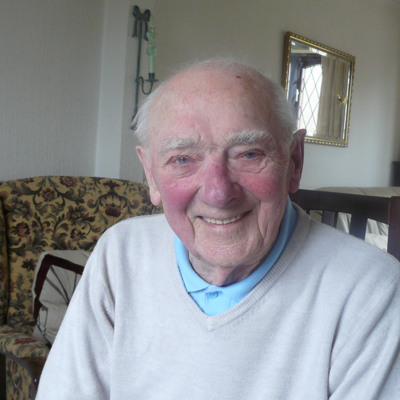 Robert Woodhouse flew operations as a wireless operator / air gunner with 207 and 617 Squadrons. 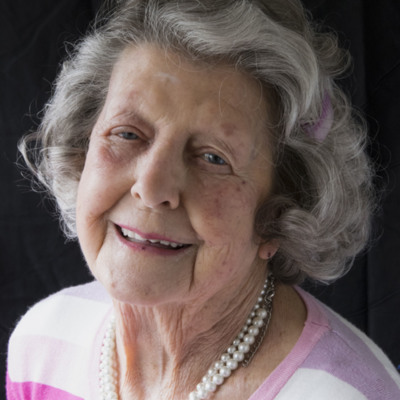 Eric Varney completed 28 operations as a mid upper gunner with 207 Squadron from RAF Spilsby. 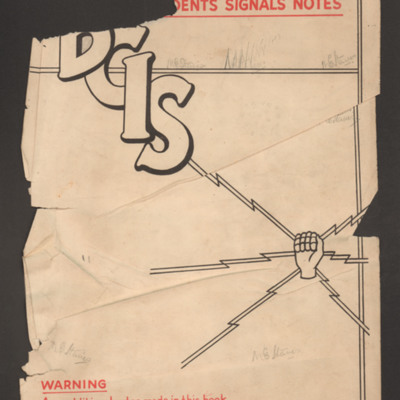 After the war Eric worked as a bus driver, coal miner, long distance lorry driver and coal merchant.